AS we head into the tail end of the final season of Hannibal, the episodes’ focus is beginning to shift with increasing frequency. This week’s episode, the confusingly named ‘And The Woman Clothed With The Sun…’ (it shares its name almost entirely with the previous episode), shifts its focus away from our main cast of characters and towards some of the secondary focal points. Reba McClane, the sweet, blind photo developer at Franics Dolarhyde’s company, gets some time to shine while we see the surprising return of Bedelia Du Maurier and take a trip down memory lane to the time she first learned what Hannibal was. The main focal point though is Dolarhyde himself – we see more of the turmoil within the troubled man and see some of the steps he takes to address that conflict inside him. Thus far, we have seen only bits and pieces of the peripheral characters – a small bit from Chilton, an appearance from Freddie Lounds and even Jack has had a very much diminished presence in this final section of the season. As of this episode, the ‘suffering’ wife of ‘Dr. Fell’, Bedelia Du Maurier, can be added to that list. There are no truly major developments in this episode but with the characters making these minor appearances it seems that this episode was mostly set-up, moving various pieces into place for what will undoubtedly be a charged, violent finish to this final season. The television adaptation has not, thus far, given us a great deal of information regarding this ‘Tooth Fairy’ – yet, it has given us enough. We know that he has a plethora of issues, regarding his self-worth, his self-confidence and his appearance. There seems to be some element of childhood abuse in there somewhere in the mix and clearly his deformity is not helping matters but somehow (and the crucial part here is the ‘how’) that unsavoury mix of trauma results in a man who in unhinged even by Hannibal standards. This week Hannibal offers us some further insight into just what is turning the cogs in this psychopath’s head. There are three key events concerning Francis Dolarhyde in this episode. The first is his conversation with Hannibal. He clearly has an unhealthy obsession with Hannibal’s actions – you could argue that there is no such thing as a healthy obsession in this regard – and more than anything, he seems to crave the incarcerated doctor’s approval. Luckily for him, Hannibal is more than willing to put up the necessary dog and pony show if it means giving himself a directly controllable pawn in the free world. The episode features a fairly jarring shift in the art style – as we moved away from the bright, vivid colours of the Italian portion of the season, we move towards a colour scheme somewhat reminiscent of the painting from which this arc gets its name. 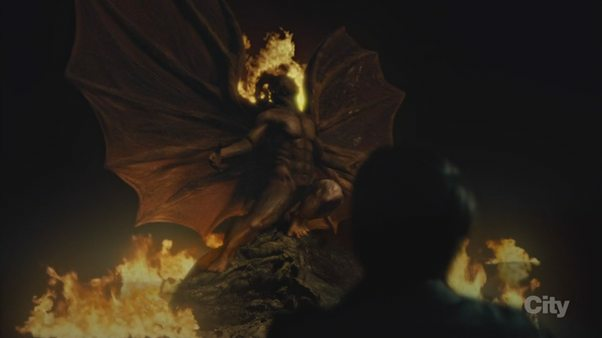 The CGI of Richard Armitage as the Great Red Dragon from the painting is off-putting not just because of how over the top is it but also because of how suddenly the volume of CGI in the episode increased. Throughout the seasons, we have seen the wendigo and the fan-dubbed Ravenstag appear time and time again, but in the context of a dream/nightmare/hallucination, those elements seemed to blend in fairly well. 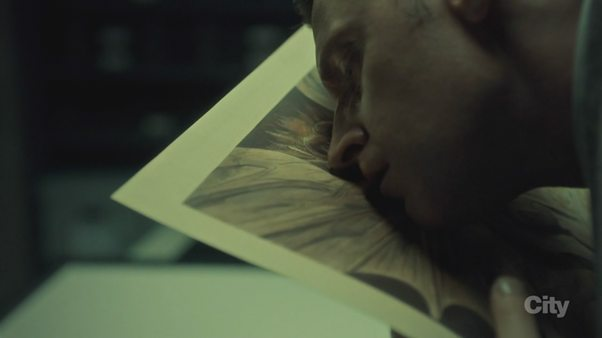 Perhaps it was because we have not had time to slowly build towards Dolarhyde’s final form that this reveal in the episode feels so disconcerting but either way, it was not one of the episode’s stronger moments. 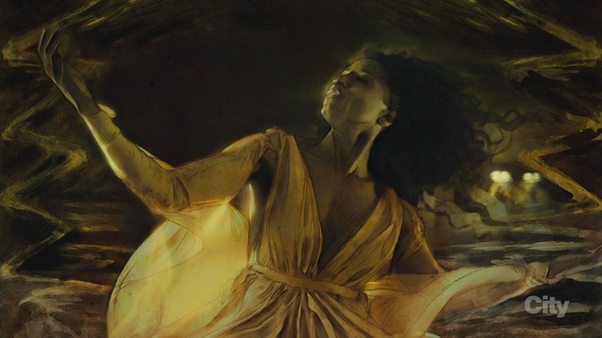 The other instances of CGI usage in the episode were much better handled though; the imagery of innocent Reba McClane as the woman clothed in the sun from the painting completed the rather obvious attempts at creating the metaphor of Francis as the Red Dragon. Francis’ developing relationship with Reba McClane is the second key event of the episode – in the painting, it seems that the Red Dragon represents this untamed ferocity, the savagery of a demonic beast while the woman it stands triumphantly over is a representation of pious innocence. It isn’t difficult to see the parallels between the painting and the characters but what the painting doesn’t provide us with is a conclusion; how does that scenario end? Is the woman’s piety enough to stay the dragon’s bloodlust? Or does the dragon consume her just as we might think? Reba’s influence on Dolarhyde as a character is fascinating. On one hand, she shows him the kindness and affection that he has probably been denied his whole life and in 99% of those dealing with childhood trauma issues, that might be a welcome first step on the road to recovery. Unfortunately for everyone involved, Dolarhyde is very much the pinnacle of the 1% and he seems to associate the happiness he feels at being loved with a murderous rage – his victims thus far have been happy, loving families and if Will and Hannibal are to be believed, Dolarhyde somehow thinks that the consumption of these families will eventually allow him to complete his transformation. So now we have a conflict within our secondary antagonist (Hannibal has yet to vacate the position of the primary) – he must pick between his relationship with Reba and his powerful homicidal lust. The two overlap in troubling ways at times – when he brought Reba to the zoo to touch the dying tiger, a gesture that was simultaneously creepy and cute, he seems to be aroused by her rapturous expression as she felt the tiger, especially its teeth. We know how Dolarhyde earned the nickname of Tooth Fairy and while tigers and dragons are very different animals, it would seem that Dolarhyde saw himself as a tiger (a predator, much like his Red Dragon) during that time and felt some kind of vicarious pleasure from Reba touching the tiger. That particular sequence also featured some great CGI, showcasing how Dolarhyde’s description coloured (quite literally) Reba’s impression of the animal, from the vividness of the colour to the way it seems to seep into its surroundings. The final key moment regarding the Tooth Fairy was, of course, his consumption of the painting that has been both a torment and inspiration. There is something very visceral about the way Francis actually eats the painting – there is a desperation and genuine hunger to his actions at the time. Just what was he trying to accomplish by eating the painting? It is one of those bizarre actions that could have any number of explanations – perhaps he thought that by ‘eating’ the dragon, his transformation would be complete but at the same time, there is some sense to the idea that ingesting the painting could silence the dragon within him once and for all. Neither explanation is really satisfactory; completing the transformation by eating the dragon is all well and good but Francis has never seemed quite comfortable as the dragon but at the same time, consuming the dragon would indicate that he has decided that Reba is his future but surely one does not drive away madness by diving further into it? Regardless, there is a notion floating around here about Dolarhyde quite literally internalizing his demons. The dragon, by virtue of being red, is quite reminiscent of our modern conception of the devil – a red, powerful figure and ties in fairly well with Hannibal’s entire shtick of fire that consumes. The sequence of events ends with his brief confrontation with Will – Dolarhyde knows Will thanks to Freddie Lounds’ ridiculous excuse for journalism – but what is significant now is that Will knows what Dolarhyde looks like. Attractive as Armitage is, Dolarhyde seems plain enough that apart from his extraordinary creepiness, he could pass off as a rather common man in most situations. His cleft lip makes him much more distinguishable though it’s unclear whether Will saw it or not. The way Dolarhyde manhandled Will made it extremely clear that Dolarhyde is in the Hannibal/Jack Crawford league of fighters within the show’s universe – not someone that Will can take lightly. Yet, Will doesn’t seem to quite realize the danger he is in. It’s exceptionally staggering because after all that he has been through you would think that he would have developed a healthy respect for the criminally insane. There is danger all around him, really; Dolarhyde is an obvious example but so too are Hannibal and Bedelia Du Maurier. Freddie Lounds and Frederick Chilton are no friends of his either and Jack and Alana’s stance towards Will is perhaps best described as neutral. Yet, Will continues doing his thing as though this were season one instead of three; last week, there was a chilling warning that Will was beginning to absorb bits of the Tooth Fairy the way he once absorbed Hannibal; he woke in the middle of the night after a dream in which he killed his family and was covered in blood under the moonlight. Of course, of all the threats mentioned above, perhaps the most surprising is the one that Bedelia represents. Dr Du Maurier is a difficult woman to respect. She clung to Hannibal until it was convenient to disengage herself – that by itself is perfectly understandable – but right after that, she feigned herself out of taking any responsibility for her actions and worse still, without doing nearly enough in helping the likes of Jack and Will in understanding Hannibal and his motives. We have known for some time now that she is one of the coldest characters in the series but her conversation with Will this week illustrated that she is perhaps just as damaged as some of her patients. Her ideas of righteous violence and what she calls our ‘primal instinct to reject the weak’ are troubling not just because of how they push a very relative moral scale but also because of how relevant they are to Will’s current situation. Will, being Will, does have some instinct to help Dolarhyde – the same way he wanted to help Hannibal run away – but Du Maurier’s advice is to just fire first and ask questions later. If Will follows her advice, he could easily label it righteous violence and no one would be the wiser but there is something repulsively perverse about the way that Bedelia operates. 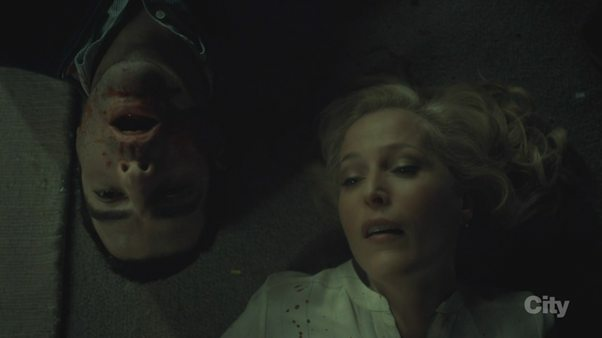 Throughout the last season, we were led to believe that Hannibal manipulated a patient into killing Bedelia and that she had to kill him to protect herself – righteous violence. Yet, as we see this week, her poor patient (played by none other than Spock/Zachary Quinto) repeatedly tells her that he is being manipulated by Dr Lecter but she doesn’t do a thing, and in the end, he has a seizure in front of her and instead of helping him, she kills him. She and Hannibal have much more in common than we were led to believe before and suddenly her horror at seeing death first hand becomes much less sympathetic. That said, Hannibal’s ability to draw out the worst in people is part of what makes him so very dangerous. Now that he has Will’s new address with him, it is only a matter of time before he returns to his old tricks.